The week of the annual Scoil Uí Chonaill Dinner Dance is upon us. Saturday evening is set to be another fantastic occasion in Clontarf Castle. All new members are encouraged to come to the Dinner Dance and meet club members, new and old, as we celebrate what is a truly remarkable club. Tickets are available to be collected and paid for in the club on Thursday evening (24th January) from Declan Hoban from 8.30 to 9.30 p.m. If you pay online please text Declan Hoban your name and the number of tickets paid for on 0876539943. It is super to see our under 8 team taking part in the indoor hurling in Gormanstown on Sunday mornings. It is a fantastic initiative, and no doubt the players are improving their skills immensely. Also, the comfort of indoors is enjoyable for both players and spectators alike! 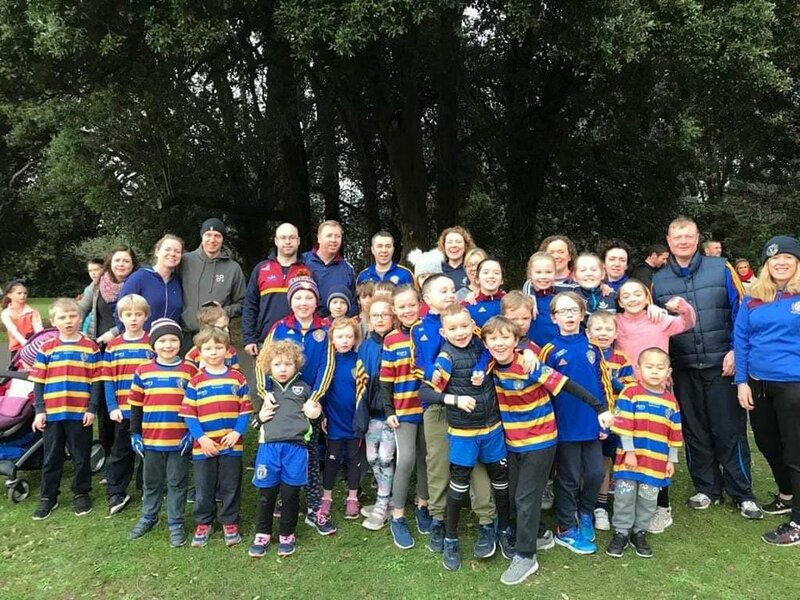 Attached is a picture from the Under 8’s in Gormanstown and a picture from the Junior park run in St. Anne’s, which was enjoyed by a great Scoil contingent. Well done to all! Nursery - 9.45 - 11 a.m. Under 8/9/10/11 Boys - 10-11 a.m. Under 12/13/14/15 Boys: 11-12 p.m. Under 9-11 Girls: 11-12 p.m. Under 16 Girls: 11-12 p.m.
Tuesday and Thursday evenings 7.15-8.00 p.m. in Scoil. Tuesday and Thursday evenings 8.00-9.15 p.m. in Scoil. Tuesday 7.50pm - 9.30pm in Marino Hall. Thursday 8pm - 9pm in Scoil. The Level 1 coaching course continues in the club this Friday 25th of January from 7.00 - 8.30 p.m. This is a great opportunity for anyone wishing to get into the coaching side of the game and coaches Tommy Naughton and Jonny Rock received great feedback from the first session. Niamh Crowe wishes to extend her appreciation for all of the members of Scoil Uí Chonaill that have sent wishes to the family for the late Fred Crowe. Niamh cannot thank everyone individually, but wants everyone to know that it was hugely appreciated to see members of the Scoil Executive and all club members who paid their respects. Thank you. The main goalmouths on the Scoil pitch are closed at the moment due to ongoing maintenance. Please refrain from using the main pitch during the winter months, if possible. The annual ‘Mentors Night’ has been scheduled for the 16th of February in the club (again, subject to change). There will be a big push for this nearer the time for anyone in the club to come down and enjoy an evening in the club, but until then, save the date!